Happy Bloggers Challenge Friday! Thanks so much to those of you who played along with last weeks In Bloom Challenge, it was wonderful to see all the blooming entries! It is slowing warming up here, and I even heard the birds chirping outside my window yesterday, that surely must mean Spring can't be too far off! While it may not be beach weather just yet, I hope this weeks challenge of By the Seashore takes you to someplace tropical and warm! I created a monochromatic card with a splash of light blue for my trip to the Sea, all stamps are from Our Daily Bread Designs. 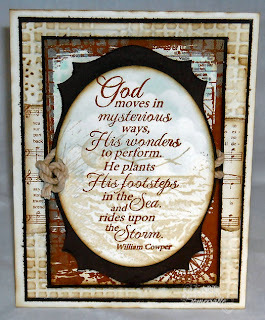 To create my card, I stamped The Mighty Sea in Ranger Antique Linen Distress Ink on Vanilla, then cut the card stock with Spellbinders Oval Dies, and used a SAMJ to add the quote from The Sea in Sepia Archival Ink, once dry, I sponged in some Light Blue clouds. The Oval panel is layered on Spellbinders Labels 25 (I cut mine down middle to make it a tad smaller), then added some Rope to embellish. I layered this panel onto the stamped lighthouse (ODBD's Keep my Lamp Burning). I added some splashes of Blue to this stamped panel, by adding some Ranger Acrylic Paint to a Gelli Arts Plate, then smooshing a Texture Fades Folder into the ink, then pressing down my card stock. The bottom Vanilla panel is embossed with this same Texture Fades Folder, I also added a portion of the Hymn from ODBD's It is well with my Soul set. If you'd like to play along with this weeks Bloggers Challenge, please link back to this post on your blog and mention you created your card for the Bloggers Challenge By the Seashore Challenge. Please add your link using the Link Tool below, your link should be a direct link to your Bloggers Challenge Post, use your name as the Title. Please do not link to cards that were created prior to the challenge date. Entries not linking properly, or backlinked will be removed. If you have the captcha enabled on your blog, please consider turning it off, as it makes it so much easier to leave comments. Very lovely piece, would be proud to have it anywhere in my home!!! You are a true artist with your medium. Absolutely beautiful, Lisa. Love that verse...!! Beautiful card! Colors are fab, rockin' that Gelli! Gorgeous!!! I love everything about this card!!! 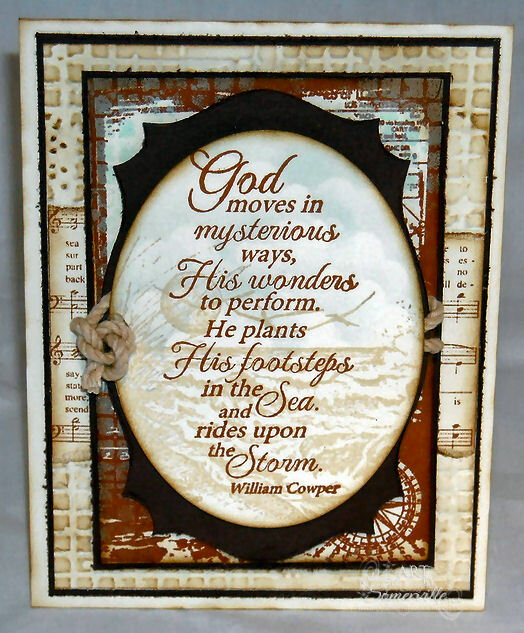 I love this, the sentiment with your beach scene behind it is beautiful. I am behind so hoping to get one done later today. Absolutely beautiful. Fabulous combination of images and backgrounds. Love it. Love that soul warming background! Beautiful card! Have a great Friday! This is beautiful, Lisa ... so simple yet so elegant! Gorgeous card! Love the soft effect of the neutral seascape. So lovely! The color scheme and rope accent are perfect choices for this seascape themed piece.